Post and Rail fencing is suitable for gardens, fields and paddocks. 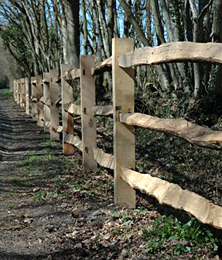 We can supply post and rail fencing using our own oak or softwood that has been pressure-treated with Tanalith E which protects against rot and insect infestation. 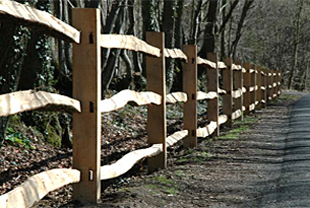 We can now also supply post and rail fencing manufactured using larch, a naturally resinous timber making it naturally more resistant to water infiltration. 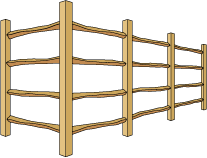 Posts can be square-sawn, round or half round and rails can be square-sawn, half round or cleft. Post can be supplied with 3 or 4 mortices to accept tennoned cleft rails. 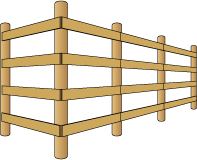 It is recommended that square- section and half-round rails are nailed to posts. Please contact our sales staff if you need help in selecting the correct fencing for your project. Post and rail fencing constructed using solid oak posts and oak cleft rails. 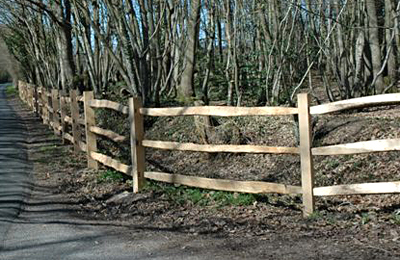 Mortice and tennon fencing with square posts and cleft rails. 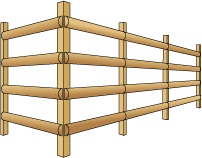 Half-round rails nailed to square posts. Square section rails nailed to round posts. Other combinations of posts and rails are also available.